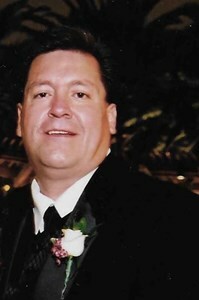 Newcomer Family Obituaries - Bernard 'Buddy' Alex Trujillo 1958 - 2019 - Newcomer Cremations, Funerals & Receptions. Services : April 23, 2019 at Notre Dame Catholic Church at 10:00 a.m.
Bernard was born in Denver, Colorado on June 21, 1958 to Bernard and Lucille Trujillo. He was the youngest of four siblings, brother Terry Trujillo, sister Christine (Zeke) Dimas, sister Denise Trujillo (deceased). Bernard lived his life as a strong family man. Among those who will miss him are his wife Laura, stepson Brandon Ramos, mother in law Ramona Martinez, Brother in laws Lawrence (Michele)Martinez, Leonard (Cynthia) Martinez and numerous nieces, nephews, uncles and aunts, cousins and lifelong friends. Bernard was a larger than life type of person. His family and friends all benefited from having Bernard in their lives. He had a keen sense of humor and an outgoing personality. Bernard was also a sports fan having played football and basketball in his formative years. Bernard was also an avid fan of the home teams. Later in life, Bernard’s favorite sporting activity was golf and he would often be found on a golf course enjoying the game with family and friends. One of his favorite activities was the annual golf trip that he and his friends took every year. Bernard worked in Marketing/Sales for the phone companies; Mountain Bell/Qwest for over 30 years. He left the phone company to start his own real estate company, Park Avenue Real Estate, and loved the real estate business completing real estate deals even a few days prior to his death. On January 26, 2001 Bernard married his loving wife Laura and together they helped raised Bernard’s stepson, Brandon. Bernard and Laura enjoyed traveling, sports and time with friends and of course golf. Bernard self-labeled himself a “big puppy dog, which was reflective of his loving and giving nature. Bernard loved people from all walks of life and he frequently was the life of the party. Bernard’s selflessness routinely went above and beyond in carrying out acts of kindness and love and he willingly gave of himself to everyone he touched. In lieu of flowers, please consider a donation to the American Kidney Foundation. Add your memories to the guest book of Bernard Trujillo.